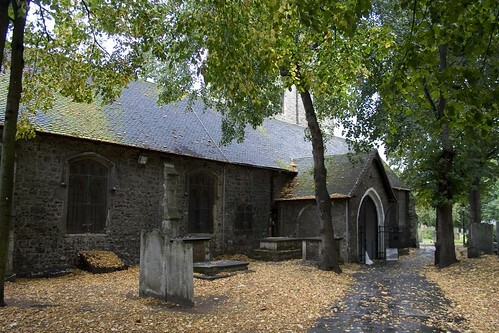 Some 800 years ago, a church was built in the grounds of the existing Barking Abbey and while the Abbey has long since vanished, the church still remains as a cornerstone of Christian worship in the town. The Abbey itself was founded even earlier, in the demonic year of 666AD by the Saxon Lord Erkenwald, but then demolished in the 1540s during that great schism with Rome enacted by King Henry VIII. Today only the Curfew Tower remains standing alone at one end of the Abbey grounds, although an outline of some of the buildings is visible. Although long since suppressed, there is still a catholic priest who holds the titular title of the Abbot of Barking Abbey. The church itself though, dedicated to St Margaret is still imposing and along the northern side, very pretty indeed in the autumnal weather. Sadly, the southern side was enlarged in 1991, and while sympathetic to its older neighbour, the faux-stone building really doesn’t sit well next to an ancient church. They should have gone for full-scale modern or not at all, in my opinion. I arrived just as Sunday service was finishing as this is still a very active church, and has a young and rather evangelical looking congregation. Even as an atheist, I am rather fond of Anglican churches, where The Queen is the Head of the Church, and God is seen as an optional extra. Evangelical congregations make me a tad uneasy. 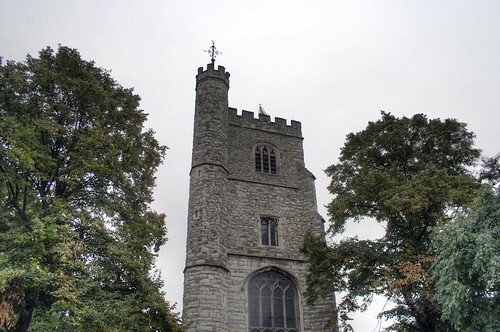 Although the chancel to the church can be dated to the 1200s, the distinctive stone clock tower was added about 200 years later to house 8 bells. It was in fact seeing the clock tower when passing in a taxi on the North Circular Road a couple of months ago that suggested a visit might be worth while. 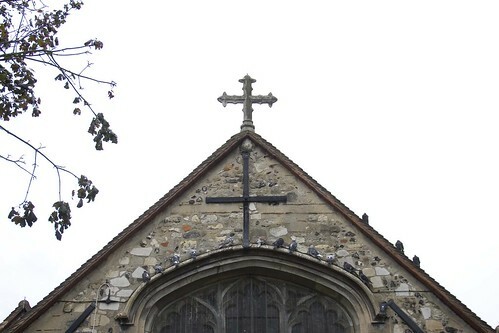 The local pigeon population seem to find one single window on the church appealing. Maybe they are religious pigeons? 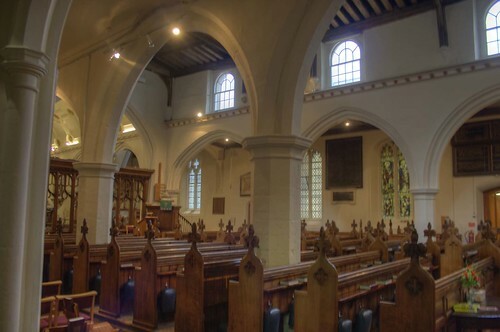 Inside is a modestly plain interior, which was probably stunning under its pre-puritan times, but has retained its plain aesthetic ever since Cromwell deployed the whitewash. A good history display is at the rear by the original doorway. I came in through that more atmospheric doorway, but by the time I wanted to leave, it had been locked shut – so I had to leave via the modern extension. I suspected that the church which looks lovely in autumn could be rather picturesque in the winter – and I was right judging by the photos at the bottom of this page. Difficult to believe that this “country church” is actually surround by major roads and sits next to one of the most depressing high streets I have seen in many a year. There is a direct link to the City of London though – as it was Barking Abbey that originally oversaw the church of All Hallows, which sits next to the Tower of London. for the first time .A charming setting,community atmosphere and welcoming staff.